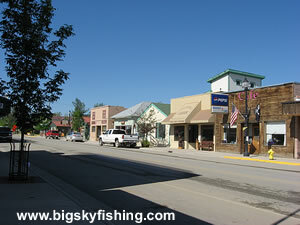 The little town of Absarokee, located twelve miles south of Columbus on Highway 78 in southern Montana, becomes a busy place during the summer. Thousands of tourists pass through Absarokee every day on their way in-between Red Lodge (and the Beartooth Highway) and Columbus (the junction with Interstate 90). The downtown area of Absarokee is small but very clean and attractive. The town is full of small stores and has plenty of places to shop for both the basics as well as more “tourist related” items. The location of Absarokee is hard to beat. Although the town is located out in a rolling prairie that consists of grasslands and hay fields, the Beartooth Mountains loom to the south and provide a scenic backdrop to the entire area. Anglers will also enjoy Absarokee’s location, since the Stillwater River flows right through town. The Stillwater has superb trout fishing, and numerous fishing access sites provide excellent access to the river. Those interested in float trips will also find much to like about Absarokee. Guided float trips down the Stillwater River are available for those who arrive without a boat. And for those with their own boats, a very popular float and fishing trip is to put in near Absarokee (at one of the many fishing access sites on the Stillwater River that are near town) and float down to the confluence with the Yellowstone River in Columbus. Absarokee is the focal point for many scenic drives in this part of Montana. The Bridger Creek Backcountry Drive begins just outside of town and heads to the west, while the Absarokee Scenic Loop makes a forty-four mile loop that begins and ends in town. Finally, the beautiful Beartooth Front Scenic Drive passes right through town. Despite the scenic setting of Absarokee, and despite the superb fly fishing found in the Stillwater River, the reason I love visiting Absarokee during the summer is because I can finally find my favorite ice cream. I adore quality bubble gum ice cream (not the blue stuff or the awful version served at Baskin Robbins). Over the past few years though, that flavor seems to be going out of style since it is very hard to find. Happily, the busy Dew Drop Inn, located right along Highway 78 to the north of downtown, carries the best bubble gum ice cream in Montana as far as I’m concerned. If you fancy yourself a connoisseur of fine bubble gum ice cream like I do, the twelve-mile side-trip off Interstate 90 is time well spent. There are no hotels in Absarokee. However, Columbus, located just twelve miles away along Interstate 90, has several hotels. There are also many campgrounds (some free, some paid) in the Absarokee area.